According to him, protecting local firms as done by other countries who are the greatest examples of well-performing economies in the world is critical if Ghana is to industrialise and compete favourably with the giants. Protectionism is protecting domestic industries against foreign competition by means of tariffs, subsidies, import quotas or other restrictions on the imports of foreign competitors. The Speaker however noted with concern the hurdle Ghana has to surmount in order to fully protect its local business entities in an era of a globalised free trade market due to the dictates of the World Trade Organisation (WTO). The WTO free trade policy eliminates discrimination against imports and exports where buyers and sellers from different economies may voluntarily trade without a government applying tariffs, quotas, subsidies or prohibitions on goods and services. Prof Aaron Michael Oquaye made the observation during a courtesy call on him by the new Turkish Ambassador to Ghana, Mrs Ozlem Gulun Ulueren. He congratulated the new Ambassador on the presentation of her credentials as the official representative of Turkey. 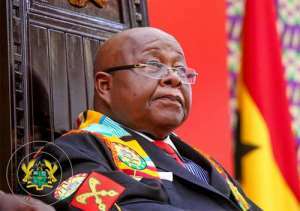 Ghana he said has very strong respect for that country which always believes in its conviction and is self-sufficient in its locally manufactures goods whiles commending its airline ensuring safety, comfort and good service delivery at all times. The Speaker emphasised the urgent need for Ghana and Turkey to strengthen parliamentary relationship in addition to their long standing economic, social and political ties where best practices can be shared. He urged Turkey to make available its best practices to affect Ghana's quest to industrialized and called for Turkish investments to help Ghana produce goods locally to help shift the current paradigm of dependency syndrome. Mr Speaker who is also a former Ghanaian ambassador to India challenged both countries to ensure cultural and educational exchanges for the learning and exchange of ideas and best practices. The Turkish Ambassador to Ghana, Mrs Ozlem Gulun Ulueren in her part said it is her objective to increase contact and exchanges between Ghanaian and the Turkish Parliaments to enhance bilateral relations at that level whiles learning best practices. She disclosed that Turkish investment in Ghana and Africa has witnessed significant increases over the years. Mrs Ulueren assured to help Ghana in the area of capacity building and support vocational training for young people with the Turkish example. The Ambassador assured of her country’s readiness to share experience and knowledge whiles hoping that the relationship grows to higher heights. Turkey, she said believes in the 'Ghana Beyond Aid' agenda which is exhibited in government’s One District one factory, one village one dam, planting for foods and jobs mantra among others. She noted that Turkish contractors have invested more than a half million dollars into the Ghanaian economy ($ 500, 000) over the last few years and believes that will increase further. Turkey she said has awarded several scholarships to Ghanaian students whiles stating that a Turkish University has signed a memorandum of understanding with the University of Ghana for exchange of students on scholarship. The Ranking Member on the Foreign Affairs Committee, Samuel Okudzeto Ablakwa said Ghana and Turkey’s relations begun since 1958 when diplomatic relations started. According to him, Ghana cannot mention its improved airport infrastructure without talking about Turkey contractors who played key roles in that effort. Mr Ablakwa who is the Member of Parliament for North Tongu indicated that trade volumes between the two countries have increased significantly especially in 2015. He identified Turkish ceramic tiles and carpets as being very popular in Ghanaian homes and urged the need for increased collaboration in that sector for mutual benefits. The lawmaker noted that people to people engagements can be deepened through scholarships to young students to share in the diversity of humanity in different cultures.